For a generation that came of age in the 1980s, the music and videos of “Weird Al” Yankovic—and to a much smaller, but still significant extent, the 1989 comedy UHF—were a gateway to absurdist comedy, gently bridging the gap between kid-friendly silliness and jokes that are much further afield. A child weaned on Police Academy sequels or, say, the appalling robot pimp in 1984’s The Ice Pirates could have no trouble giggling at song parodies like “Eat It” or “I Lost On Jeopardy,” but might come to appreciate, however unconsciously, Yankovic’s songcraft or the peculiar places his lyrics could go. There’s nothing estranging about Weird Al’s sensibility in the least, yet there is that word “weird” right there in the name, teasing out a latent appreciation for the offbeat in kids who still like breakdancing robots and the guy who makes the funny noises. Comedy fans who later embraced Mr. Show, Charlie Kaufman, or even more austere strains of surrealist humor can trace a squiggly line back to Yankovic, and have happily set their own kids on a similar path, which has given his career remarkable longevity. But make no mistake: Weird Al is, by nature, a cult figure, a jester who doodles on the fringes of much bigger mainstream phenomena. This explains why UHF was the Young Einstein of the summer of ’89, in spite of reports that it enjoyed some of the best test screenings in its distributor’s history. (Given that the distributor was Orion Pictures, the most loveable of loveable losers, that achievement comes with a Sammy Sosa-sized asterisk.) There have been other claims that UHF simply couldn’t compete in the summer that brought us Batman, Lethal Weapon 2, and Indiana Jones And The Last Crusade, but that’s only partially true. Lethal Weapon was the only one of the three that premièred anywhere close to UHF, and that was two weeks earlier, giving audiences enough time to see it and look ahead to the next big thing. But it was nonetheless a sapling among the redwoods, the type of movie that studios stopped releasing in the summer, and eventually stopped making altogether. It was inevitable that it would fall to the margins—and be embraced, in this case, a bit more fervently than such a fitfully inspired movie deserves. UHF got a PG-13 rating for a handful of violent scenes, like “Conan The Librarian” delivering a ghastly charge for an overdue book, Emo Philips losing a digit to a buzzsaw, and a poodle getting thrown out a window during a demented animal show called Raul’s Wild Kingdom. Though Yankovic ultimately (and correctly) refused to make the necessary cuts to bring it down to a PG, he did design UHF primarily for the younger set—accessible, silly, and a little eccentric, like a spoof-centric Pee-wee’s Playhouse. Most of the references will not be lost on children of any age, from the Raiders Of The Lost Ark parody that opens the film to nods to Star Wars, Close Encounters Of The Third Kind, Gandhi, The Beverly Hillbillies, and other widely accessible cultural touchstones. 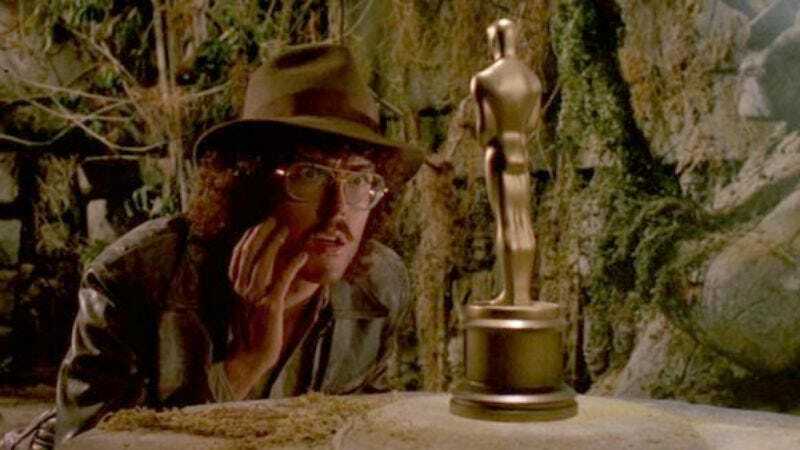 The degree to which Yankovic and Jay Levey, his co-writer and director, tweak the references makes all the difference: Replacing the golden idol of Raiders with an Academy Award is the stuff of, well, lame Academy Awards telecast bits, but having the boulder stalk Yankovic from the Sphinx to an urban street corner is endearingly strange. And when UHF dispenses with references entirely, that’s usually when it’s funniest. A vaudeville for the TV-addled mind, UHF pokes fun at the medium’s less-dignified moments, like Geraldo Rivera’s The Mysteries Of Al Capone’s Vaults fiasco (here, rendered as a look into Al Capone’s glove compartment) or The Morton Downey Jr. Show (here, having a talk-show host berate Satan as a “pinhead”), but it doesn’t engage in any Network-like scolding. On the contrary, it’s a celebration of those unruly outposts where anything can happen, and the dedicated coach potatoes who click their way down these odd little tributaries. UHF’s best moments feel like one of George’s daydreams, the sort of TV one might hallucinate while half-asleep at 2 in the morning. That’s how Wild Kingdom becomes a show where the host whips a turtle onto the ceiling and declares it “nature’s suction cup,” or Romper Room is commandeered by an idiot savant whose best friend is a mop. Yankovic picks up on all the flotsam and jetsam that the airwaves deposit on the shore, and turns UHF into his own giant salvage yard—half trash, half treasure.